I have a lot of healthy recipes “pinned” to my HealthyThoughts board on Pinterest. (feel free to follow me here) This is another pin worthy one I came up with as I have been seeing a lot recipes for desserts utilizing avocado. I’m kind of hooked so you will definitely be seeing more of these kinds of recipes in the future. This delicious chocolate pudding gets its rich creaminess from heart healthy avocado. You might be put off by the sound of chocolate and avocado in the same sentence, but trust me it’s good! So good in fact that Chris couldn’t even tell there was any in there. Enjoy as a healthful snack or even for breakfast. 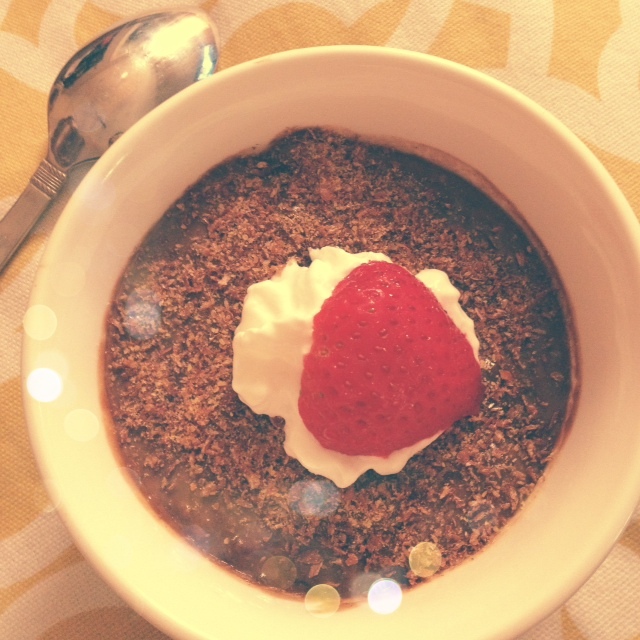 Eat as is or top with ground flax seeds, a touch of whipped cream and strawberries.